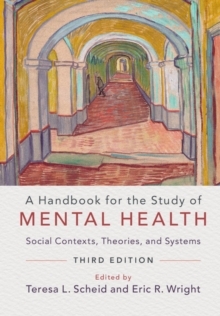 With chapters written by leading scholars and researchers, the third edition of A Handbook for the Study of Mental Health provides an updated, comprehensive review of the sociology of mental health. The volume presents an overview of the historical, social, and institutional frameworks for understanding mental health and illness. Part I examines the social factors that shape psychiatric diagnosis and the measurement of mental health and illness, the theories that explain the definition and treatment of mental disorders, and cultural variability in mental health. The section addresses the DSM-5 and its potential influence on diagnosis and research on mental health outcomes. Part II investigates the effects of social context on mental health and illness. Part III focuses on the organization, delivery, and social context of mental health treatment. The chapters in Part III address the likely impact of the Affordable Care Act on mental health care. This volume is a key resource for students, researchers, advocates, and policymakers seeking to understand mental health and mental health delivery systems.